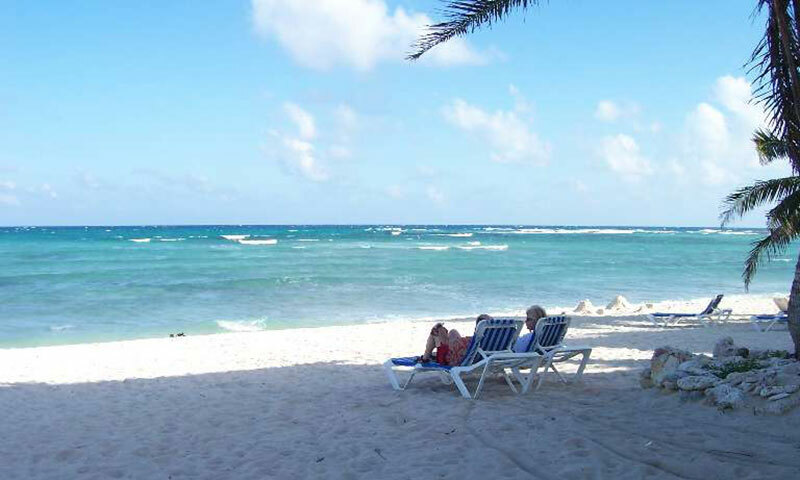 In Spanish, Playa Blanca means "white beach", which is exactly what awaits you on Half Moon Bay in Akumal, Mexico. 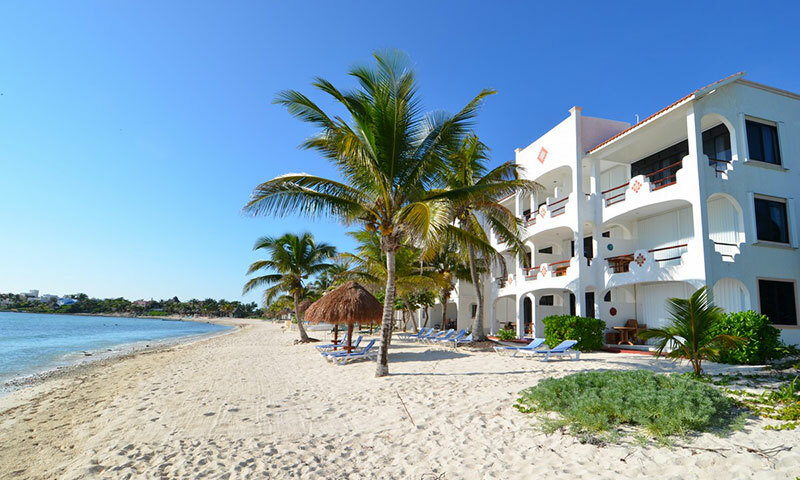 The white sandy beach and crystal clear water are just steps away. 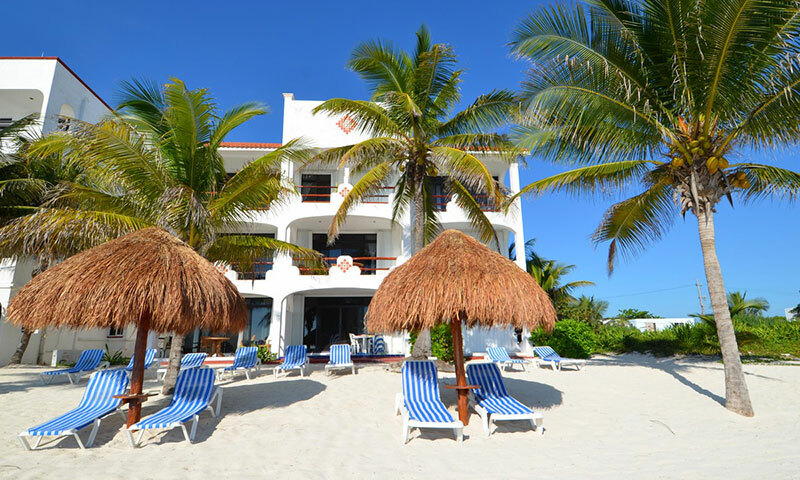 Playa Blanca offers 1, 2 and 3 bedroom units as well as casitas. The three story building has three, 2 bedroom condos on the first two levels and two, 3 bedroom penthouses on the third floor. The quality of furnishings in each condo varies depending on the owners' personal preferences. Regarding floor plans, one bedroom condos are actually a two bedroom condo with the rear bedroom locked off. All of the master bedrooms have king beds, private baths, and a large, ocean view window facing the living area with shutter style doors that can be open or closed for privacy. The garden side guest bedrooms, depending on the unit, have either a single and a double bed, or a double and bunk beds. 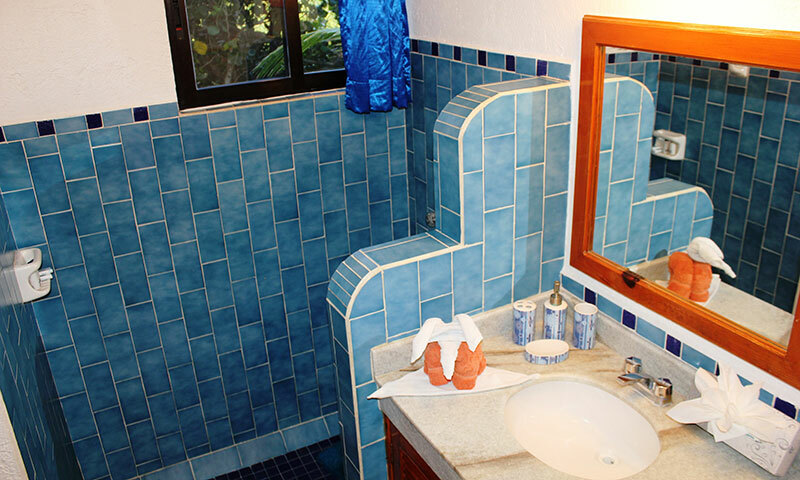 All guest rooms have private baths. The 3 bedroom penthouses have a separate entrance next door to the condo and is only included when 3 bedrooms are reserved. It's on the garden side of the building and is totally self-sufficient with a double bed, kitchenette, private bathroom with shower, and an exterior sitting area on the entrance terrace. This bedroom is perfect for young adults or a nanny as it offers a bit of freedom from disturbing the rest of the group. The front door to this 3rd bedroom is about 25 feet from the main condo's entrance. There is also a roof top seating area, open to all guests, that is great for sunsets. Main living areas consist of a large living/dining room with a kitchen off to the side divided by a tiled breakfast bar with seating for three. 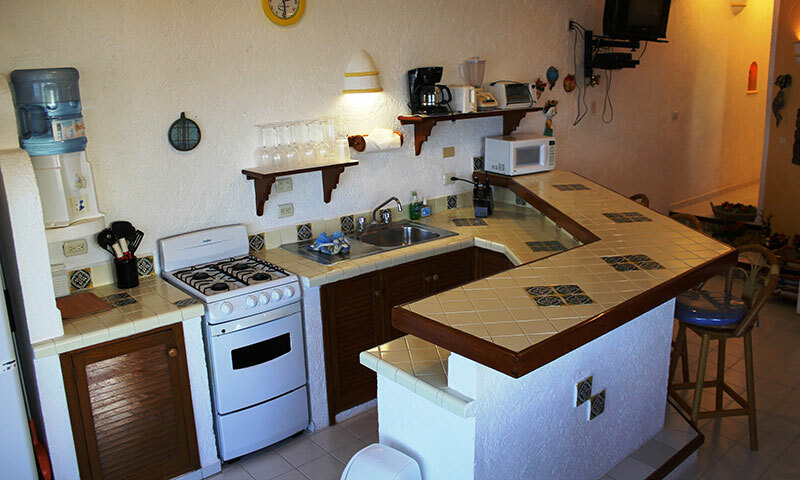 Kitchens have a gas stove/oven, major small appliances and service for 6 people. Large screened sliding glass doors lead to a spacious, furnished terrace. Blue Caribbean ocean views are stellar from pretty much the entire interior of all these vacation homes. All units have WIFI and air conditioning. The beach at Playa Blanca is at on of its widest point on the bay. 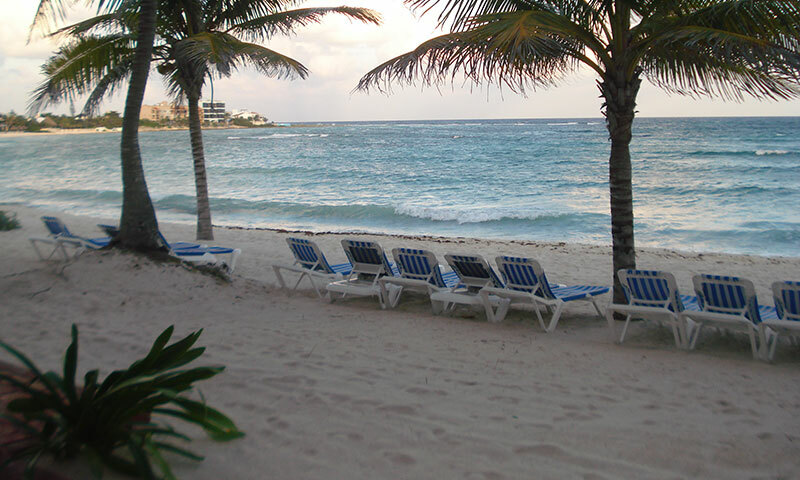 There are beach chaise loungers with palapas and Coconut palms providing shade. Half Moon Bay is protected by a natural coral reef that is teeming with underwater marine life. Daily Sea Turtle and Ray sightings are not uncommon. Turtle nesting/hatching season runs from June through mid November. There are four restaurants within walking distance, two of which are on the beach. Bicycles and golf carts are available for rent. Maid service is daily. 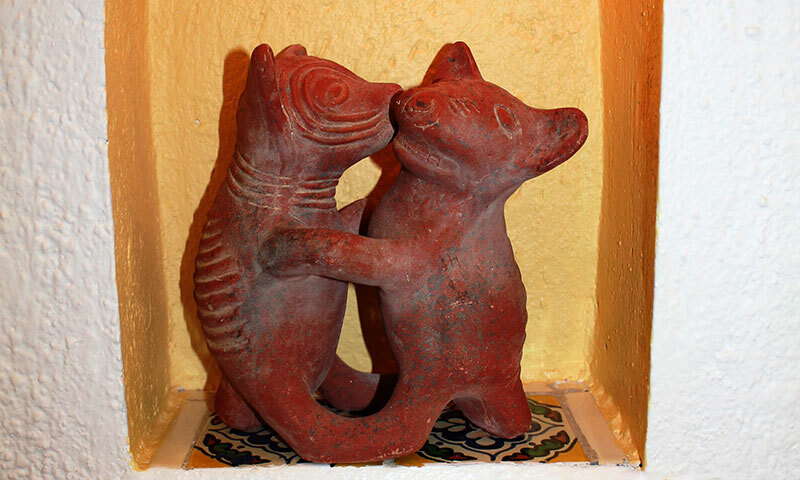 Akumal has many outdoor activities, browse Sol Maya Area Activities for a complete list. 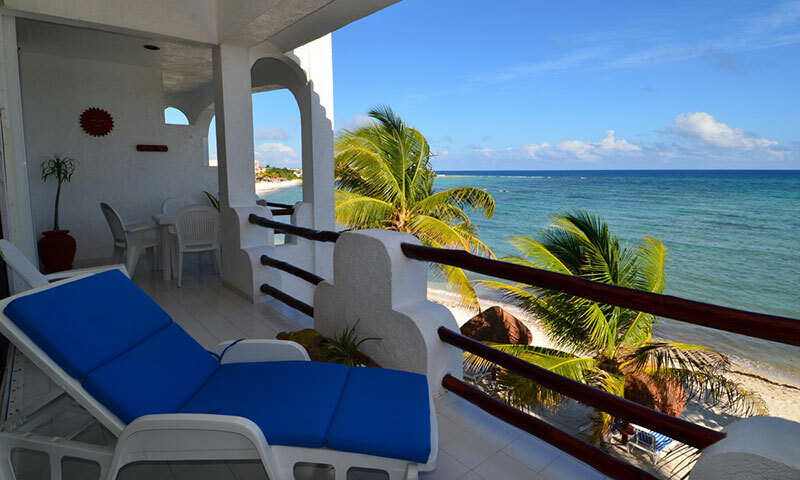 Playa Blanca #1 is a charming beachfront Condo located on Half Moon Bay, Akumal. 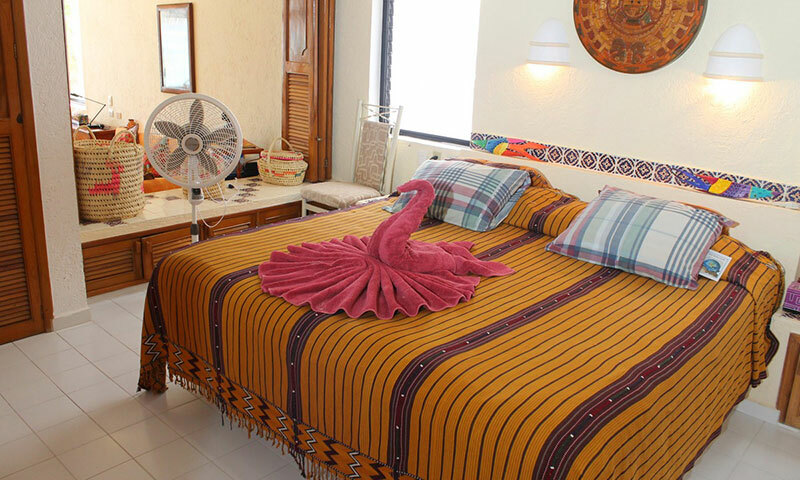 This vacation home radiates Caribbean charm with brightly colored walls, handmade Mexican decorations and beautiful woodwork. 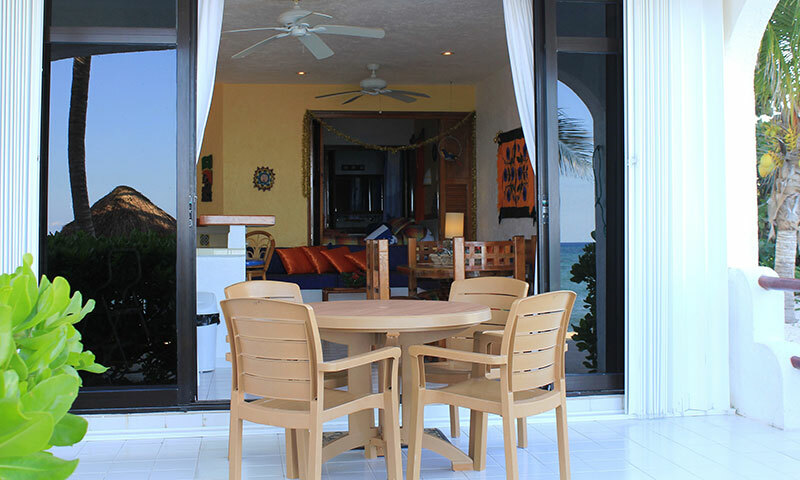 Its ground floor location is perfect for friends and families who enjoy the ease of coming and going to the beach area. Surround yourself by comfort and natural beauty in this beachfront condo. 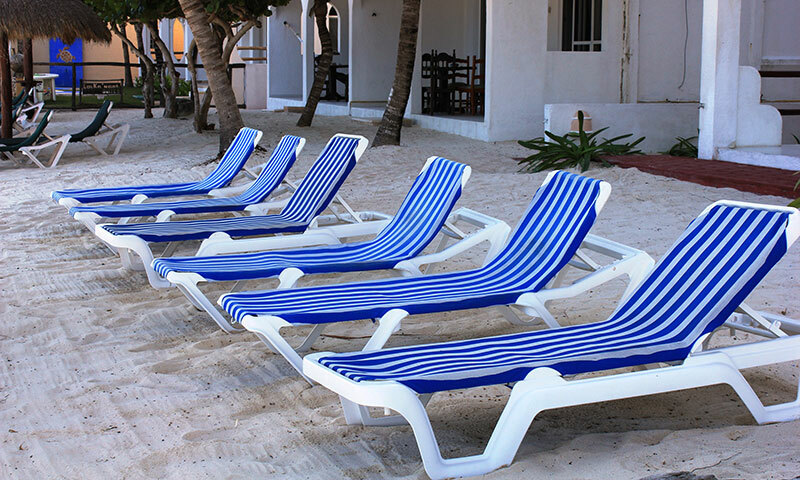 Take a nap in the terrace hammock caressed by the Caribbean soft breezes. Make a feast and dine Al Fresco at the patio table. 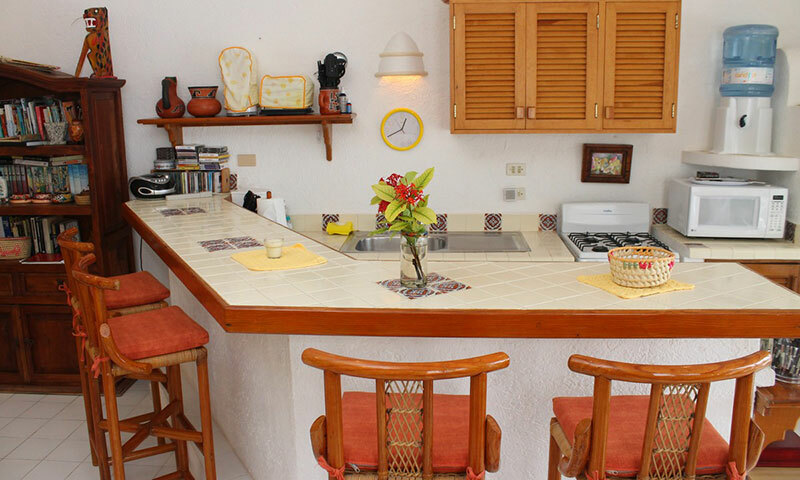 You can do it all at Playa Blanca #2. This is a ground floor unit, on the south side of the building. The ocean view master bedroom has a pillowtop king bed, satellite TV with DVD player, private bath, and air conditioning. 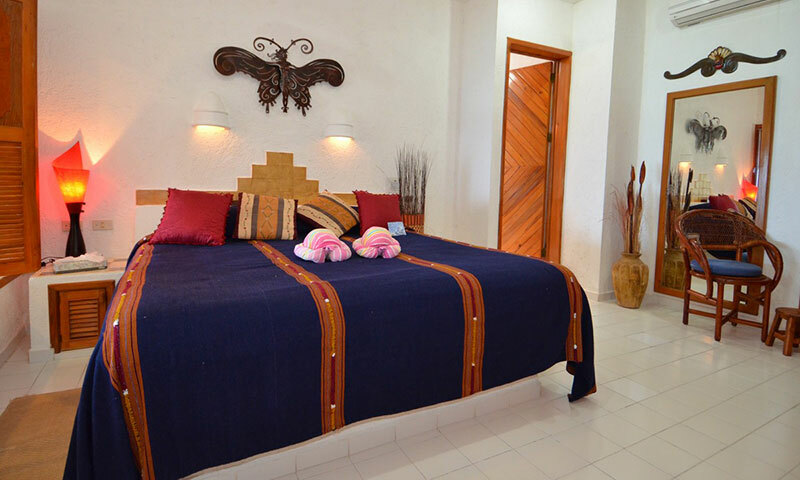 The guest bedroom has two new double beds, TV/DVD, small refrigerator, private bath and air conditioning. This is a second floor unit, on the south side of the building, offering incredible views and excellent privacy. The ocean view master bedroom has a pillowtop king bed, TV with DVD player, private bath, and air conditioning. The guest bedroom has a set of beds, a double bed with pillowtop mattress, TV/DVD, small refrigerator, private bath and air conditioning. 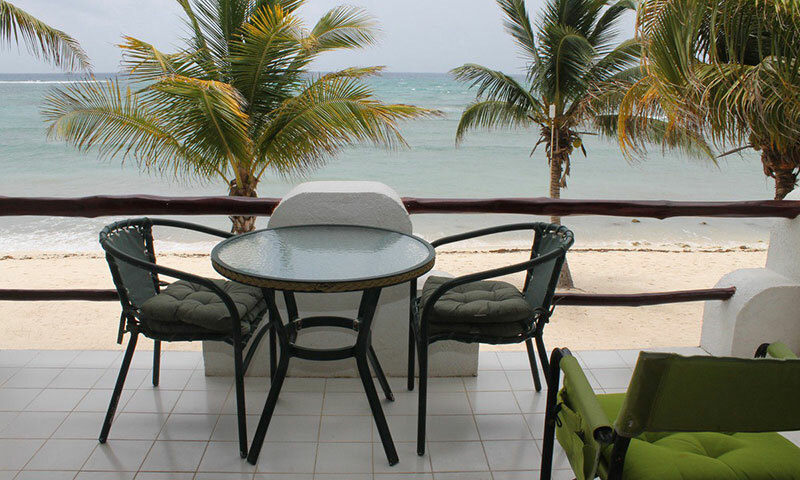 Comfortably accommodating up to 7 adults, this Penthouse unit offers incredible Caribbean Ocean views and over 1600 square feet of living area.